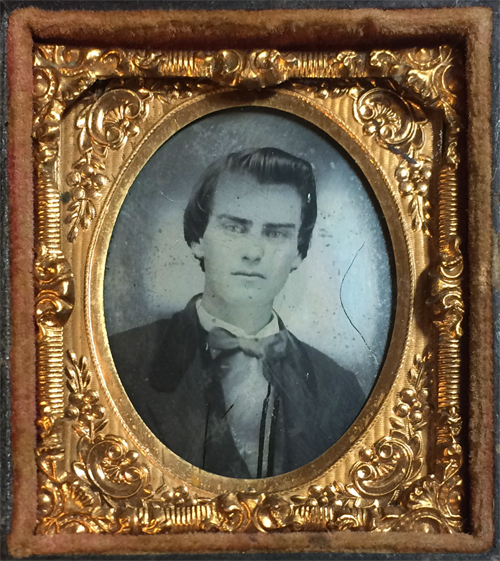 I admired this cased ambrotype, along with a smaller, cased tintype (shown at the end of this post), for at least a year, as they sat listed on etsy. The seller mistakenly identified the sitter as William Wallace. He overlooked the next word, which I came to discover was the surname of Hungerford. William Wallace Hungerford was aged 16 when the above image was captured on January 1, 1861, in Lansing, Michigan. He was the son of a farmer, Lyman Hungerford, and grew to follow in his father’s footsteps. Although I’m sure William’s life wasn’t uneventful, it doesn’t appear to have garnered much attention in the newspapers. That is, until he ran off to live with hoboes. Much of the text in the article above is not the best quality. Here is a transcription, if you’d prefer an easier read. “Wallace Hungerford, aged 64, who is said to possess a fortune of $100,000 at his home in St. Johns, Mich., is being held at the city hospital until he is sound enough to accompany his attorney, H.E. Walbridge, to his home. For the past year Hungerford has been living in the slums of the city chumming with hoboes and spending money with a high hand on all unfortunates that chanced to cross his path. He was found in a cheap lodging house, in company with a gang of tramps who had been living on his bounty for some time. So, what’s a weary willie? The newspaper article uses it as another term for a hobo. However, I learned that a hobo would be quite offended to be referred to in this manner, as they took great pride in their work ethic. Weary willies, on the other hand, avoided work, and spent their time looking for handouts. In 1898, William’s wife, Ann Chloe (Tracy), filed for divorce, after thirty years of marriage, on the grounds of drunkenness, and extreme and repeated cruelty. Although she dropped her initial complaint, Ann was granted a divorce in 1901. The article above mentions that William had been “”queer” for some time.” Another article refers to him as eccentric. Was William always a peculiar fellow? Did his overuse of alcohol play into this perception of him? Or did his mental faculties fail him in his later years? William died in 1913, of tuberculosis, while he was a patient in the Kalamazoo State Hospital in Michigan. I’d say that he was using alcohol due to an undiagnosed mental illness. Self-medicating as we would call it these days. In those times not being diagnosed would’ve a blessing as they couldn’t have done much to help him, could they? Ending up in an institution would’ve been worse than the illness. I feel for him and his poor wife!